Advanced, Powerful, yet can go anywhere. 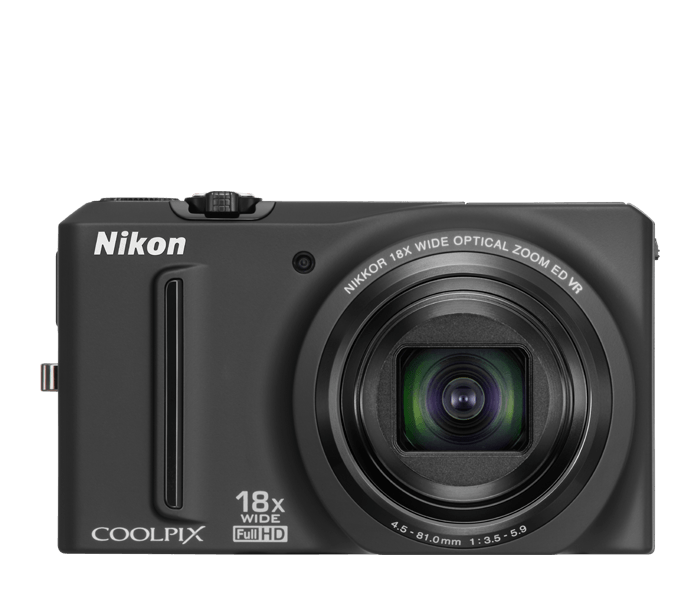 The new Nikon COOLPIX S9100 is loaded with innovative Nikon technology, like a 12.1-megapixel CMOS sensor that assures superb image quality in low-light conditions. Optimized with Nikon’s exclusive EXPEED C2 processing engine, you’ll capture natural looking pictures with exceptional detail. You’ll also love composing images on the large three-inch Clear Colour Display. This dazzling 921,000-dot, ultra-high resolution display that makes viewing photos and HD movies instantly gratifying. Whether you’re people watching in Paris or waiting for just the right light to hit the Grand Canal in Venice, the COOLPIX S9100’s High-Speed Shooting feature captures five photos in approximately one second at full resolution. And Subject Tracking keeps the camera automatically focused on your moving subject. At 1.4 inches thin and 7.6 ounces in weight, the portable COOLPIX S9100 is the perfect travel companion, no matter where in the world you take it. Wide angle, high power 18x compact Zoom-NIKKOR glass lens. Producing precision camera optics is at the heart of Nikon’s proud photographic heritage. The COOLPIX S9100 is no exception. Its high quality 18x wide-angle optical Zoom-NIKKOR ED glass lens offers impressive telephoto coverage (25-450mm) with outstanding colour capture and razor-sharp results. This is the only lens you’ll ever need for exacting portrait studies, scenic panoramas, and challenging compositions. Plus, we realize that shooting from the roof of an SUV, a gondola overlooking the Swiss Alps, or a whale-watching boat in Iceland can get bumpy. That’s why we’ve included a five-way, Hybrid VR Image Stabilization system with the COOLPIX S9100. It uses sensor shift in combination with electronic stabilization features to minimize the effects of camera shake, so you can say goodbye to unwanted streaky or blurred images. Create a scene and get the most out of every shot. With Night Landscape mode, capture high quality images at night. It shoots a series of consecutive shots and composes them into a single, brilliant image. Night Portrait mode takes outdoor portraits against bright backgrounds and combines multiple shots to capture the essence of night scenes. And, the COOLPIX S9100’s Backlighting HDR Mode automatically provides optimum exposures when you’re shooting backlit subjects. Bring back Full HD (1080p) movies of your treks around the world. Sharing your travel adventures—or posting them on the Internet for friends and relatives—is even more exciting with Full HD (1080p) movies. While the COOLPIX S9100 can capture hundreds of memorable still images for you to easily print and save, its moviemaking features bring a safari, ski trip, cruise, or balloon ride to life. One touch of the movie recording button and you’ll be shooting 1080p HD movies—complete with stereo sound. Plus, optical zoom and auto focus functions will bring you close to the action. You can even shoot still images while recording movies, or experiment with special effects like fast or slow motion. When the time comes to share your movies, simply use the in-camera playback feature or the convenient HDMI-CEC output for quick hookup to an HDTV or computer. In-camera special effects that don’t require post-shot processing. You don’t want to be hassled with post-shot processing, which is why Nikon equipped the COOLPIX S9100 with in-camera special effects. These advanced features help you take shots you’ve never considered before! You can re-capture yesteryear with the Nostalgic Sepia effect, or try some intricate black and white shooting with the High-Contrast Monochrome feature. This versatile camera also lets you highlight bright areas of a photo with the High Key effect, or highlight dark areas with the Low Key mode. A Selective Colour feature boosts the vibrancy of specific aspects of a photo or movie, while Soft Effect subdues harsh elements for a gentler, silkier look. The COOLPIX S9100 even has a Creative Slider to adjust the brightness, intensity and hue of an image. When traveling on an exotic adventure, you can’t afford missed photo opportunities. You’ll find Nikon’s Motion Detection feature to be important because it identifies moving objects and automatically adjusts shutter speed and ISO to assure crisp, blur free images. When conditions conspire against you, Nikon’s Best Shot Selector automatically takes up to 10 shots and saves the sharpest image. ISO speeds up to 3200 will help you capture great shots in low-light. Blinking eyes and red-eye can ruin portraits. That’s why the COOLPIX S9100 includes Blink Warning. It also offers in-camera Red-Eye Fix that automatically corrects red-eye as you shoot and Skin Softening that smoothes skin tones. The COOLPIX S9100 also has Macro Shooting for shooting as close as 1.6 inches. And, when you’re in remote regions, you’ll appreciate the camera’s 270-shot rechargeable Li-ion battery.